Mick Ebeling is an amazing man who decided to take action when he reads about a boy in South Sudan who had lost both of his arms. Daniel Omar lost both of his arms when he was injured by a bomb blast. Mick has three sons of his own and was devestated to read Daniels story. In 2012 Daniel told a time reporter that he wished he had died in the blast as he was concerned about the burden placed on his family by his disability. Even though Mich Ebeling was thousands of miles away in Los Angeles he wanted to help Daniel. 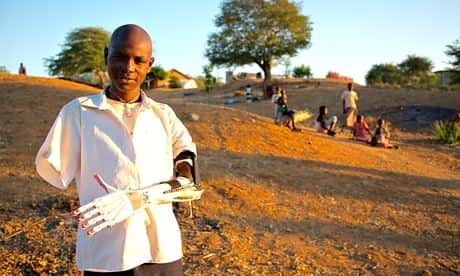 So in 2013 he travelled to Sudan hoping to find him and build him an arm. Mich took a 3D printer with him as well as plastic cables and all other necessary equipment. He used the printer to create a simple mechenical arm. The arm is triggered by movement, movements trigger the ligament like cables that are threaded through the arm. When the cables are triggered it causes them to tense so that the fingers and parts of the arm can be moved. Unfortunately this device can not be used to help those who have no arm at all. It needs to be attached to something substansial in order to operate. It is estimated that more than 50,000 amputees are currently in South Sudan and many of them could be helped by this amazing technology.